Rivet|MRO was featured in the March/April edition of Industrial Supply Magazine article, Stop Throwing Money Away. What if I told you that your distributorship intentionally threw away a $30,000 check every year? That’s if you’re lucky. Chances are, the check your distributorship is throwing away is bigger. Much bigger. The average independent industrial distributor with $30 million in revenue is probably missing out on more than $50,000 in co-op funds. That’s like throwing away $50,000 every year that could have been invested in growing your business. How much product would you have to sell to earn $50,000 to spend on marketing? It’s around $1.6 million (if your distributorship nets out at 3 percent pre-tax profit, as most do, that would be the profit generated from $1.6 million in sales). How much effort would you put into a $1.6 million sale? How much effort do you put into claiming co-op marketing funds? 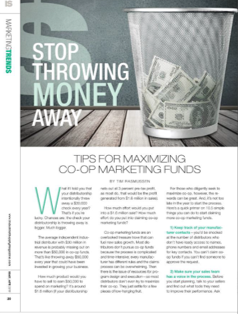 Co-op marketing funds are an overlooked treasure trove that can fuel new sales growth. Most distributors don’t pursue co-op funds because the process is complicated and time-intensive; every manufacturer has different rules and the claims process can be overwhelming. Then there is the issue of resources for program design and execution—so most distributors don’t even try to maximize their co-op. They just settle for a few pieces of low-hanging fruit. For those who diligently seek to maximize co-op, however, the rewards can be great. And, it’s not too late in the year to start the process. Here’s a quick primer on 10.5 simple things you can do to start claiming more co-op marketing funds. 1) Keep track of your manufacturer contacts—you’d be shocked at the number of distributors who don’t have ready access to names, phone numbers and email addresses for key contacts. You can’t claim co-op funds if you can’t find someone to approve the request. 2) Make sure your sales team has a voice in the process. Before you start planning, talk to your sellers and find out what tools they need to improve their performance. Ask them what kinds of promotions work with your customers. Document their wish list and refer to it as you develop your funding requests. And there’s a bonus benefit: when your sales team has a say in the planning, they have a greater buy-in when it comes to execution! 3) Ask your manufacturers for co-op program details and save them in a single co-op file. Having the co-op program rules in-hand makes planning their use much easier. 4) Involve the manufacturer in the planning process. Learn about their priorities that align with yours. Meet early in the year. The earlier you engage, the better. Some manufacturers won’t approve requests late in the year. 5) If your manufacturers don’t have formal co-op programs, ask them if they have informal programs. How do they determine budgets? What types of initiatives do they prefer to support? Make sure your requests reflect this input. 6) Be prepared to demonstrate how you will drive and track co-op program results. Manufacturers are more willing to support co-op marketing projects that will provide a return on investment. 7) Demonstrate how you will apply your co-op support to strategic initiatives that are in alignment with the manufacturer’s key focus(es). If a manufacturer sees linkage between your co-op request and their key initiatives, there is a higher likelihood your request will be funded. 8) Develop an overarching marketing positioning strategy. Marketing is about telling compelling stories—what’s yours? What makes you better and different? Understand that and make it come to life in your co-op marketing programs. 9) Ask about Market Development Funds—they are often separate from co-op funds. These kinds of funds might be available when the manufacturer has an important new product launch or asks you to pursue a new market for their products. 10) Don’t let your internal resources drive your co-op planning strategy. Find external resources to help you find, claim, manage and use your co-op funds. Just because you don’t have internal video production resources, for example, that doesn’t mean you shouldn’t pursue video co-op projects. 10.5) Commit to the plan. Maximizing co-op funds is about perseverance. Get organized and remain focused. Follow-up regularly with your manufacturers, especially your bigger ones. Still daunted by the complexity of co-op? Don’t be. Where else can you get free money to grow your business? Tim Rasmussen is the founder of Rivet|MRO, a marketing consulting firm that focuses exclusively on independent industrial distributors. One of the firm’s major services is its Co|optimizer co-op maximizer program. Rivet|MRO also provides strategic marketing consulting, marketing analytics, distributor-specific syndicated social media management, and traditional resources of a full-service agency. For more information, visit www.co-opMAXIMIZER.com and www.rivetMRO.com. Co-op marketing is beneficial to independent industrial distributors because it allows you to market your products at a lower cost. Product suppliers will opt for co-op marketing because both the supplier and the retail business benefit from the marketing plan and therefore share the cost of advertising. Still, co-op marketing isn't necessarily problem-free despite its value. That said, here are a few tips you can use when utilizing co-op advertising. Although your co-op marketing plan consists of cooperative advertising, you'll want to have each ad approved prior to placing it to make the most out of your co-op plan. This is because many product suppliers will have co-op requirements that you'll need to meet as a retail business to receive your co-op reimbursement. Although it's a little extra work, it's always a good idea to have an ad approved before you place it. Not only because you're making sure you're meeting the co-op requirements, but also because it puts you in good standing with your marketing partner. Some suppliers will offer distributors the choice to use stock advertisements. These can be easy to place, but they don't necessarily fit or represent your customers. With that in mind, customizing your advertisements or other marketing initiatives to better suit your target audience. After you've customized them, have your custom ads approved as mentioned in the previous tip. Co-op marketing can help your business save money on marketing, but it's not a good idea to let it drive your marketing altogether. Make sure that your co-op marketing opportunities are only taking up a part of your budget and that you're reaching out in other areas of marketing, too. The more ways you're able to reach your target audience, the better. Need industrial consultancy services to help with your co-op marketing? Co-op marketing funds are a great way to reach a specific audience without taking a major marketing risk. But $14 to $35 billion dollars in manufacturer co-op marketing funds go unclaimed every year. This is because it can be difficult to figure out how best to manage your distributorship’s co-op marketing funds. 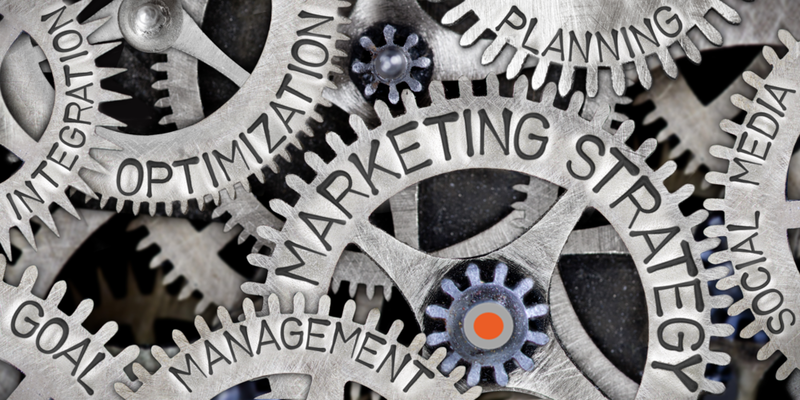 Fortunately, the industrial consultancy services of Rivet|MRO can help you navigate your co-op marketing plan to ensure your marketing is done right. To learn more about how our industrial marketing agency can help you, contact Rivet|MRO today. Most industrial distributors leave tens—even hundreds of thousands of co-op marketing dollars on the table every year. The cost of a co-op marketing campaign is reimbursed by a manufacturer or brand, making it a smart way to advertise and money! And, better yet, when you use Rivet|MRO’s Co|optimizer program, it’s easy! Yet, approximately $14 to $35 billion dollars in manufacturer co op marketing funds are left unclaimed every year. Here's why your business can see success when you choose to optimize your company's co-op marketing opportunities. Try this handy co-op calculator to see how much you might be leaving on the table! You can expect to see some type of co-op advertising program from most major manufacturers. Talk to your sales contact with the manufacturers you use for inventory to get more information about the co-op opportunities they offer—or, even easier, contact us! Some co-op programs will reimburse you at least 50% of what you spend on advertising and, in some cases, they may even reimburse the entire amount! It's important to note you'll need to meet specific requirements for your company to be reimbursed. This includes the content of your company's advertising. Lead generation is one of the most critical parts of marketing, whether it's used in digital or print marketing. When you use co-op marketing programs, you're helping to generate leads by reaching out to audiences you may not have been previously reaching out to. This is extremely valuable because it gives your business the chance to build relationships with consumers and boost customer loyalty. Investments are tricky whether your company is large or small. The wrong marketing move can make or break your business, which is why it's so important to think long and hard before making any major decisions. Fortunately, you can use co-op marketing funds to grow your business without the risk of making a major investment. The manufacturer or brand reimburses your advertising, which lets you save money on your own marketing campaigns. Why use industrial marketing services? When you outsource an industrial marketing agency, you hand the marketing aspects of your business over to a team of professionals so you can be productive in other tasks. An industrial marketing agency can help with social media marketing, co-op marketing, and sales strategy. To learn more about how MRO marketing services can help you with your co-op funds and distributor marketing plans, contact Rivet|MRO today. Is Your Website Hurting Your Industrial Distributorship's Marketing Campaigns? Approximately 62% of marketers choose to use Facebook as their number one social media marketing platform. Although social media websites can be great to drive traffic, your number one marketing platform overall is your distributorship's website. Unfortunately, it could be your company website that's driving away potential consumers. As many businesses know, it's critical to keep your company website up-to-date. But many businesses may not know when their website needs an update. This goes double for industrial MRO, metalworking, cutting tool and safety distributors. One of the biggest signs your website needs an upgrade is if it's been two to three years since you last updated your site. Technical demands and consumers' viewing habits cause website trends to change regularly. That means, if you're not on your game, your website can quickly go from modern to out of date. How do I know if my website is an issue? A website that's been recently designed and has a modern aesthetic isn't necessarily great. In fact, some websites that have been recently updated may still be making a big impact on your marketing campaigns. But how do you know if it's your website that's causing the problem? Here are telltale signs it's your company website that's having an impact on your marketing campaigns. Your pages load too slowly. Online users will click away from a website if it doesn't load within three seconds. If your site loads slowly, consider making a few edits to get it up and going again. Your website isn't generating new leads. Websites that don't generate sales, leads, or conversions aren't doing their jobs. Look at your competitors' websites to see what their website has that yours may not. You have a high bounce rate. This is a major sign your website needs a boost. Analytics that scream 'help!' like a high bounce rate are never a good sign. Who can I call for industrial consulting services? Your brand is up to 53 times more likely to rank on the first page of Google when your business uses videos. Yet, it isn't enough to post a video on your website. Sometimes an industrial consulting service is necessary to help you find the best marketing angle. Whether you're interested in industrial consulting or MRO marketing services, Rivet|MRO has what you need. To learn more about how to improve your distributor marketing plans and how to use your co-op marketing funds, contact Rivet|MRO today. In integrated marketing, you use your business' communications and promotional tools to work toward a common goal. When you're on an integrated marketing campaign, you want to approach it in a way that makes your message clear. Unfortunately, this is better said than done. It can take a lot of time and effort to perfect your integrated marketing campaign. Internal marketing: It isn't enough to appeal to your audience. You also need to appeal to your employees. It's good for your employees to feel engaged with the branding and marketing campaign before the campaign launches. When your team feels included in the process, it makes the campaign not only easier to launch but also easier to communicate the campaign to your audience. Synchronization: Your campaign needs to do more than grab your target audience's attention. It also needs to guide your target audience through your sales process. It's recommended that your sales messaging has a similar look so your target audience is able to recognize your business and remember it. Measurement: You need to have a measurable conversion metric for your integrated marketing campaigns. Without a measurable conversion metric, you won't be able to measure the success of your campaign. For instance, up to 97% of marketers say that video has helped their users understand their service or product. Your metrics are what influence future campaigns. An industrial marketing agency can help you reach your business' full potential. Whether you're looking for more opportunities for your co-op marketing funds or you're having trouble with a sales strategy for distributors, Rivet|MRO can help. To learn more about our industrial marketing services and how we can better utilize your co-op marketing funds, contact Rivet|MRO today. By 2019, millennials will be the largest generation in America. It makes sense then that 62% of marketers have chosen Facebook as their top choice for social media marketing. That said, the industrial space skews older. An, if you're like most industrial distributors, you still have plenty of Boomers and Gen X'ers making buying decisions. So it's important not to forget about your older consumers in your industrial marketing campaigns. In fact, in manufacturing, it's especially important to appeal to decision makers of all generations. Baby boomers are still one of the largest generations in the United States, and they're just as important as millennials when it comes to your business's success...if not more so--at least for the near future. So how can you use the internet to reach older consumers? Here are a few ways you can improve website conversions for your consumers over the age of 50. Many websites try to make their fonts larger for older consumers. But larger fonts are actually the better choice for everyone. When consumers need to strain their eyes to see your content, they're less likely to stay on your website. Use fonts that are larger than 16 pt font. An 18 pt font may be best for general users and a 20 point font is ideal for older users. Most graphic designers will tell you that you should limit your graphics, such as logos and infographcis, to three colors. The same principle applies to website color schemes. In addition, make sure that your font is easy to read against the background. White font on a black background can be hard to read, as can fonts that fall outside of the black-white-gray spectrum. No one likes distracting graphics, but older consumers especially prefer minimal websites. That said, try to remove any unnecessary banners and images. You also want to avoid using pop-ups. It's often recommended that websites only use one pop-up modal window, and it's usually a request to add them to your email list. If you have more than one pop-up feature, you're going to frustrate your audiences no matter their age. In marketing, you'll often hear that millennial consumers have a short attention span. But the same is true for older consumers. Many readers will skim content rather than read it. Unfortunately, if the content on your website is important but difficult to get through you can end up confusing your audience. That said, it's good to include step-by-step instructions that are easily visible. Highlight your 'back' and 'continue' buttons as well. You don't want your consumers to be confused or stuck or else you might lose their service. When it comes to MRO marketing, sometimes it's a good idea to seek out experienced professionals to help you get the results you want. Rivet|MRO has the industrial marketing experience and knowledge about co-op money you need to succeed. To learn more about our MRO marketing services and how to use your business' co op money, contact Rivet|MRO today. The top two benefits of social media marketing include increasing traffic and increasing exposure. But it isn't enough to increase web traffic and brand exposure. You also have to get your audience to engage. If your audience isn't engaging with your social media posts, it's understandable to ask what you're doing wrong. But the truth is, you might not be doing anything wrong. You may just be missing something: transparency. 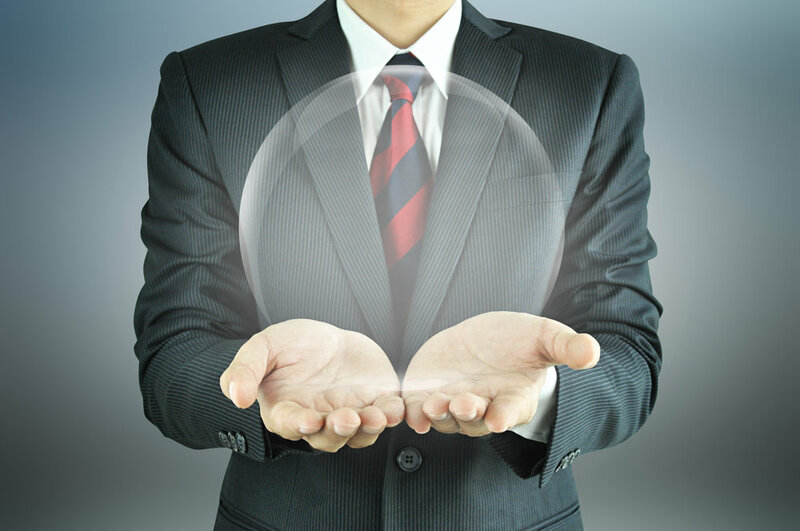 How Does Transparency Help With Industrial Marketing? Transparency and vulnerability in your marketing help to increase audience engagement. This is because they both help to create a sense of intimacy between you and your audience. Your audience doesn't want to connect with a faceless brand. They want to connect with another human. That means the more human your marketing feels, the more your audience will engage with it. And it's something the vast majority of industrial distributors struggle with. So how do you make your distributorship's marketing more transparent? The first step to improving your online presence is to get personal with your viewers. This may feel strange to you, but Label Insight reports that 94% of surveyed consumers are more likely to be loyal to your brand if it's more transparent. Tell your audience about your 'why.' Your audience may know what you do, but do they know why you do it? Your 'why' is the core value behind your business. Let your audience in the know. Talks about your wins (and your losses). Success is great and your audience likes to know they're buying from a good business. Yet failure is also a part of success. You don't need to highlight your business' failures, but make your failures a part of your story. Include them in the details of your wins. It makes your team likable. Share stories that invoke trust. Transparency is a great way to create intimacy between you and your audience. Use that transparency to create trust. Share stories that not only show vulnerability but also encourage your audience to engage with you and trust you. Sometimes your MRO marketing just isn't getting the results you want no matter what you put into your content. If this sounds like you, the industrial marketing services of Rivet|MRO may be what you need to succeed. To learn more about our industrial marketing, co-op marketing, and strategic services, contact Rivet|MRO today. Amazon used B2C lessons to build a B2B juggernaut--but you can differentiate your industrial distributorship! Amazon Business continues to stealthily grab market share in the industrial distribution space by pursing the tail spend and turning its competitors into partners. Amazon has taken the lesssons it has learned in the retail space, amplified them and used them to build a B2B juggernaut. This MDM article estimates Amazon Business generates $10 billion in annual revenues. The good news for independent industrial distributors--Amazon is not focused solely on your lines. It is also competing against McKesson, Cardinal Health, Sysco and many other mega-distributors in other sectors. For now, their goal is to capture tail spend in the industrial sector. 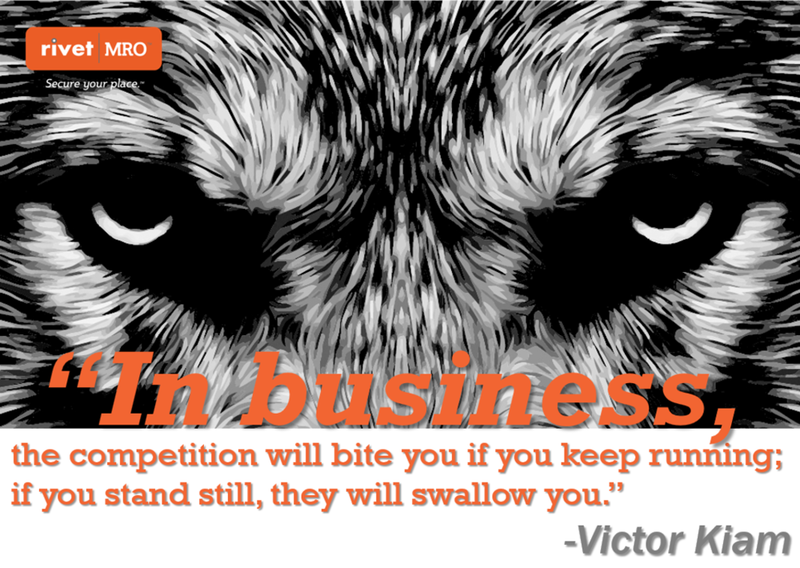 Playing the role of David vs. You-Know-Who, you have to be nimble and customer-focused. You have to sell THE ONE THING AMAZON CAN'T SELL--YOU. You have to leverage the people in your business and develop deeper, more meaningful--and more valuable--customer relationships. And you have to solve problems more than you sell product. Start with understanding your customers better and telling a more intimate, more interesting, more valuable story about how you can help them. Let us know how we can help. It takes time and energy to come up with successful marketing strategies. This is especially true for Industrial and MRO distributors, where you may not have a marketing director on hand. Yet there are a few things you can do to help boost sales without pulling time away from your other projects. Here are five things your industrial MRO distributorship can do to improve sales with minimal time and effort. Produce a video. Up to 97% of marketers say that videos boost user understanding of a product or service. Videos are also great ways to show your audience your brand personality. You can show consumers what your business is like in person and how your manufacturing process works. Update your social media. Social media marketing helps boost traffic and exposure. In fact, 62% of marketers say Facebook is their top choice for social media marketing. Yet many businesses rarely update their social media accounts after setting them up. Keep your social media accounts updated with relevant content. Make sure your marketing and sales teams work together. Marketing and sales have an immense influence on each other. Marketing drives sales and sales provide insight into marketing. Make time for your teams to communicate face-to-face. This will boost communication and results. Outsource industrial marketing services. It can be a struggle to keep up with marketing and sales strategies. By outsourcing industrial marketing services, you're putting your strategies into experienced hands. This leaves you free to stay productive on other projects. And because you're outsourcing experienced professionals, you don't have to worry as much. You can keep your blood pressure on the lower side. The industrial marketing services of Rivet|MRO can help take your business' marketing and sales strategies to the next level. For more information about co op marketing or industrial marketing, contact Rivet MRO today. Author’s note: IndustRetail blog is exploring the Six-and-a-half Steps to Mastering the Lost Art of Differentiation. The first article examined the first step—identifying your key targets. The second article looked at what makes you different. The third explored competitive influences. The previous post identified how to analyze your competitive differences. This is the fifth article in the series. Imagine a manufacturer’s rep visiting your distributorship and introducing a new product that is different than anything else on the market: gluten-free safety gloves. Their excitement is uncontained. NOBODY ELSE can offer this product. They’ve done the research, and not a single glove manufacturer offers gluten-free gloves. Well…yes, that’s true. But who cares? You pick your jaw up off the floor, astonished at this oblivious waste of your time and eagerly walk the rep out the door, vowing to convert your glove business to a manufacturer more in touch with your customers’ needs. Let me illustrate my point. These are actual taglines in use by industrial distributors today. The names are omitted to protect the guilty. At least the glove guy tried. The focus of this series is about mastering the lost art of differentiation. Different, being the root of the key word. The underlying assumption beyond different, is relevant. Some differences aren’t valuable. Let’s assume you sell blue widgets. Your competitor sells green ones. But the widgets are buried deep inside machinery and your customer doesn’t require color coding. Then widget color is not a meaningful differentiator. Find something else to separate your brand. In other words, you need to identify the differences your customers are willing to pay for. Remember, not every customer has the same set of priorities and preferences. During your analysis phase, you identified the things that are different about your business. Now is the time to filter those differences with importance and value. It’s not enough to be different. Your difference has to be better…at least for your chosen market segment(s). Customers who are focused on just-in-time delivery may be willing to pay more for it. If that’s your forte, focus on it—even at the expense of customers who don’t value just-in-time delivery. You can’t be all things to all people. Define your niche, exploit it and ignore everything outside of it. Your best customers’ answers to those kinds of questions will reveal your unique value proposition. It may be an expertise you offer. It may be a service or delivery channel. When you hear the same feedback over and over, you’ve found the gold! Those that truly differentiate keep their fingers on that pulse. They make sure it remains important, improve upon it and make it difficult to copy. Moreover they tell that story in engaging and impactful ways…they make it clear that’s why you should do business with them and show how they do it—whatever “it” is—better. Co-op Marketing Funds Vs. Market Development Funds: What's The Difference? Click here to see how much co-op money you are leaving on the table. It can be challenging as an industrial MRO company to use marketing services in an efficient and effective way in the face of advancing technology and social media. In fact, as many as 48% of marketers who were surveyed by HubSpot planned to add YouTube to their content distribution channels just this year. Fortunately, co-op marketing funds are a great way to get an advantage in industrial marketing even when you're unsure of social media. However, before you can properly use co-op marketing funds with the assistance of other channel partners, you first need to know the difference between co-op marketing funds and market development funds. What are market development funds? Market development funds, also known as MDF, are issued through an indirect sales channel. The funds are used by a brand or manufacturer to assist affiliates, distributors, resellers, and channel partners. The channel partners, etc., then use these funds to create local awareness of the brand's products. It's for this reason that MDF is often used as a synonym for co-op marketing funds. However, MDF funds are issued to partners based on a joint marketing plan. What are co-op marketing funds? In comparison, co-op funds are issued on what's considered an earned basis. The channel partners only receive a percentage of the co-op funds in order to create local awareness of the brand's products. The percentage of the funds are issued to the partners based on sales revenue and previously agreed upon initiatives. The typical percentage of revenue granted to channeling partners is between 0.5% to 3%. Which is considered the better option for MRO marketing? Co-op funds and MDF can both provide various benefits for your business and for the channeling partner you decide to partner with. Whether you choose to operate with a co-op program or an MDF program depends entirely on the manufacturing partner you work with and your individual goals. Many MRO manufacturers offer both! It can be a struggle to successfully create marketing for industrial companies and to efficiently utilize co op funds. Fortunately, Rivet|MRO can help you manage your co op funds with ease--along with market development funds (MDF). For more information, contact Rivet|MRO today.